VATICAN CITY (CNS) — People find Jesus only through humble love, and once they find him, they are called to offer him the gifts of their prayer, their adoration and their care of others, Pope Francis said. And they each bring gifts, he said during his homily at Mass in St. Peter’s Basilica. “In this Christmas season now drawing to its close, let us not miss the opportunity to offer a precious gift to our king,” especially by caring for those who cannot repay the gift. Reciting the Angelus after Mass, Pope Francis pleaded with European governments to demonstrate “concrete solidarity” with 32 migrants rescued from the Mediterranean Dec. 22 and 17 others rescued Dec. 29. The 49 people, including several children, are still on the rescue boats of the Germany-based Sea-Watch humanitarian organization; no European government has given the boats permission to dock and bring the migrants ashore. In his Mass homily and in his main Angelus address, Pope Francis contrasted the attitude and actions of the Three Kings with the attitude of Herod, who was “greatly troubled” at news of the Messiah’s birth. While the Wise Men set out to meet Jesus, Herod stayed in his palace, plotting ways to keep all his power. The glory of God born in a stable is “is symbolized by the light, which penetrates and illumines all things,” he said. But the surprising thing is that “God does not need the spotlights of the world to make himself known” or the assistance of the powerful, like Herod. “We might think that it would have been better had the star of Jesus appeared in Rome, on the Palatine Hill, where Augustus ruled over the world; then the whole empire would immediately have become Christian,” he said. 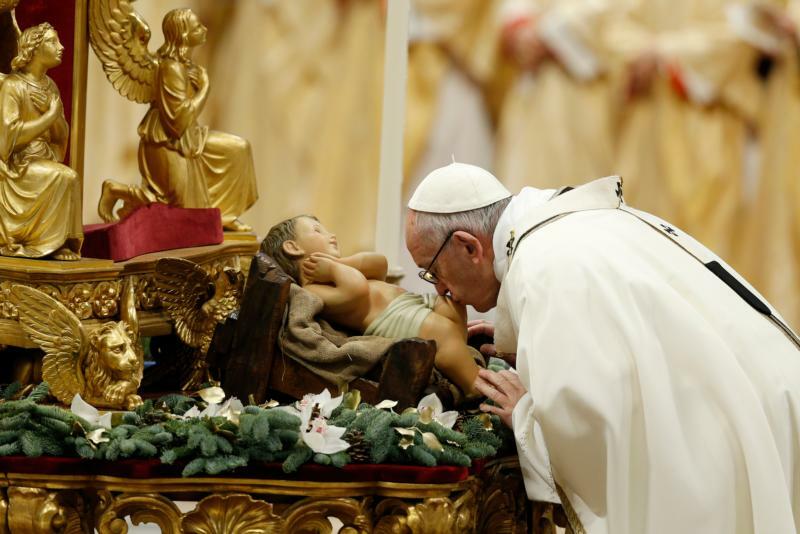 Pope Francis also spoke about the gifts of gold, frankincense and myrrh offered by the Magi to the baby Jesus.